← Parker Gallant: WHO’s facts are right! (October 6, 2014) Politics have transformed once economic subways into an unaffordable public transit option. 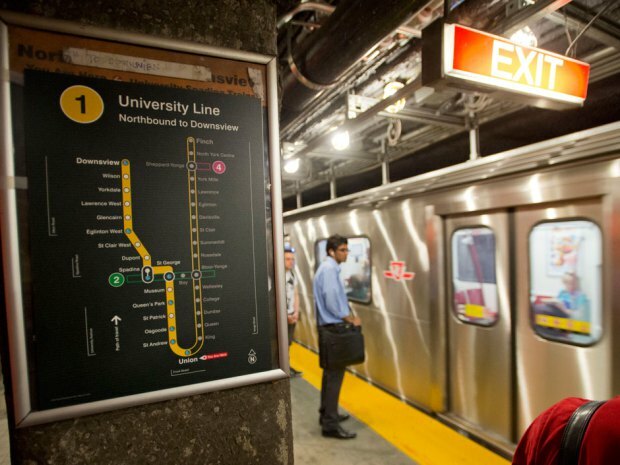 Lawrence Solomon: Instead of proposing money-losing tunnels through nowhere, under money-losing stations with next to no one and next to nothing in them, Toronto’s mayoralty candidates should tout money-making subways through the city’s dense commercial and residential districts. Laura Pedersen / National Post. A century ago, subways were economic to build, so lucrative as enterprises that the public resented the profits that the private subway lines were making. Today, subways have become money pits, so ruinously expensive that the politicians who propose them don’t even think in terms of profits, aiming only to keep losses to the low billions. Why would subways be less economic today, after more than a century of productivity gains in the field? Tunnel boring machines and other earth moving equipment are far more efficient today, as are subway cars and the electricity driving them. Thanks to automation, which now eliminates the need for drivers, labour costs are also lower. But one factor today negates a century’s worth of advances — politics, which prevents extensive underground networks in major cities, robs residents of economic transit choices, increases the market share of automobiles and consigns city streets to gridlock. Politics does this by turning the subway station into a liability instead of an asset. Subway systems — stations linked by tunnels — are inherently economic in dense cities where land is expensive. The cost of boring tunnels can only be justified when the surface land is precious. A tunnel not only frees up surface land, it appreciates real estate values, and not just because people like to locate near subway stations to cut travel time. When subways disgorge their passengers into underground malls — as major stations now do — they create a subterranean floor of high value retail that can then extend below neighbouring buildings, creating, in effect, a high-value underground city. Toronto’s PATH — a catchment area for passengers emptying out of six subway stations — supports 1,200 shops along 30 kilometres of underground streets. Its four million square feet exceed that of the West Edmonton Mall, the continent’s largest above-ground shopping mall. In this way, the station component of the subway system becomes not a prohibitive cost but a profit centre, its foot-traffic a separate revenue stream augmenting real estate appreciation from reduced travel time. Because profit is a good thing, early subway builders packed lots of stations along the subway tunnels, typically every few blocks. Having many stations means having little tunnel between stations, i.e, many profits for little tunnel expense. Toronto’s first subway, completed in 1954 without any government funds, created 12 stations along 7.5 kilometers along dense Yonge Street. In contrast to this highly economic ratio — 1.6 stations per kilometre — the subways Toronto politicians propose today in a mayoralty race focused on public transportation are highly uneconomic. For example, a line proposed to run through a low-density, suburban stretch of the city, the Scarborough Subway Extension, also runs 7.5 kilometers but with only three stations — one quarter as many as the 1954 Yonge subway and so four times less viable from the get-go. The need for this three-station subway is such a head-scratcher that planners have yet to determine what streets to route it along. All of its expected $3.5-billion cost would come from the federal, provincial and municipal governments. It can’t even be justified as a vanity project, because this money-losing line would be anything but a showcase, running near empty most of the time. Instead of proposing money-losing tunnels through nowhere, under money-losing stations with next to no one and next to nothing in them, Toronto’s mayoralty candidates should tout money-making subways through the city’s dense commercial and residential districts. A subway along teeming Queen Street, home to what Vogue magazine recently judged the continent’s hippest district, would be so profitable that a private consortium, if given a secure franchise and real estate development rights along its path — the formula of old — would likely build it at no expense to taxpayers. The consortium would make its money the old-fashioned way, by collecting fares from long-suffering passengers — the current above ground Queen Street route is badly congested — as well as by entering into development deals with property owners every few blocks along the route. As bonuses, all shops, offices and residences along the route would enjoy better transportation. The PATH network would expand to adjacent parts of Queen Street underground. And the city boundary could expand as well — as with earlier subways, the excavated earth could create a new park by the water, or another peninsula jutting into Lake Ontario that becomes a bird-filled urban wilderness park. A subway along Queen Street is long overdue — almost 70 years overdue, to be precise. Its logic was so compelling that, in 1946, Torontonians via plebiscite voted to build it. Then Toronto expanded to incorporate suburbs and Toronto’s transit system — until then self-sufficient — became a plaything to political whims. The Queen subway was shelved in favour of a route — to the poorly populated eastern and western suburbs — that served the needs of suburban politicians rather than the paying public. Because this route was uneconomic, the province had to step in with subsidies. Taxpayers haven’t stopped backfilling the public purse since. Lawrence Solomon is the executive director of Energy Probe and Urban Renaissance Institute and author of Toronto Sprawls (University of Toronto Press). Email: LawrenceSolomon@nextcity.com. This entry was posted in Energy Probe News, Privatization, Public Transit, Transportation and tagged Lawrence Solomon, privatization, public transit, Queen Street, subways, Toronto. Bookmark the permalink.